Over the weekend we were at a fundraiser and Judy’s teacher made gluten-free flourless peanut butter cookies for Judy to try. They were delicious. She told us they were the Three Ingredient Recipe but she added pure vanilla extract as well. My friend, Verna, shared this recipe with me last month and I read on our gluten-free blogger pal, Michelle’s website (gfforlife.com), a similar recipe. They all had different amounts of the same three ingredients (peanut butter, sugar, and eggs) and I combined the recipes and experimented with the amounts and added pure vanilla extract as per Judy’s teacher’s recommendation. Since we are chocolate addicts, I also topped the cookies with Hershey’s Kisses. These peanut butter cookies were always a favorite of mine growing up as my mother baked them yearly at Christmas. I have been struggling to find the right gluten-free flour ratio for these cookies ever since Judy was diagnosed over 5 years ago. I am thrilled to say these are quite tasty and no flour is needed! My gluten-eating son told me they were delicious and the whole family loved them. 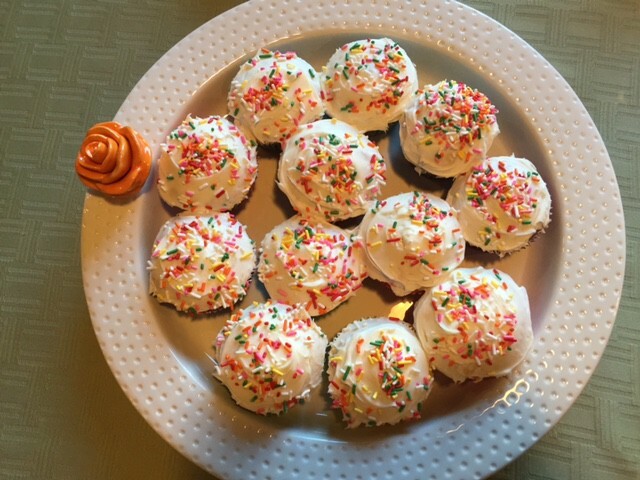 A big thanks to Judy’s teacher, Verna, and Michelle for sharing this recipe with us. By the way, Michelle is a wonderful gluten-free blogger and you should check out her webpage at gfforlife.com. These cookies were really, really good. I am so happy my mom finally made them. Don’t forget the Hershey’s Kiss! Drop dough by rounded tablespoon and place on the cookie sheet. Take a fork and press down making an X or cross with the fork. Bake for 9-11 minutes at 350 degrees. When cooling- if you want some added sweetness, sprinkle some sugar on top of the cookie and top it with a Hershey’s Kiss. S’mores dip. What more can I say? By far the most delicious late night snack I’ve made (with some help from Katie). The only ingredients were chocolate chips, marshmallows, and milk. I used Kinnikinnick gluten-free graham style crackers to dip. This S’mores dip was perfect for our first snow fall! I loved experimenting with gluten-free foods on a recipe I’ve seen on many videos. I recommend this to all! Speaking of high school, I am getting ready for the Homecoming dance right now! 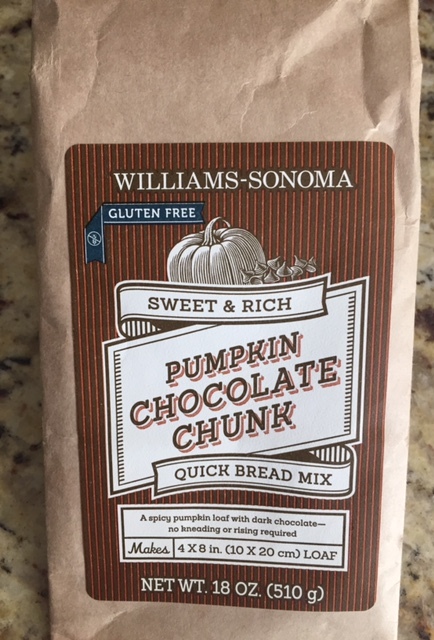 While I am getting my hair done, I am also eating this delicious gluten-free Pumpkin Chocolate Chunk Bread, by Williams-Sonoma. 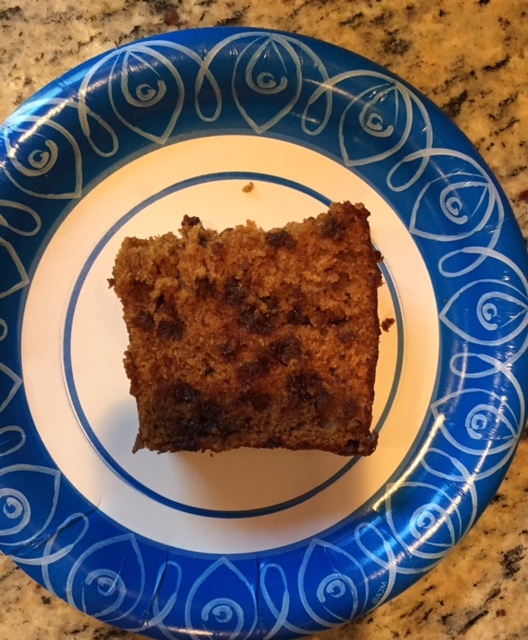 My aunt who baked this quick bread mix did add extra chocolate chips, but this yummy snack is delicious! 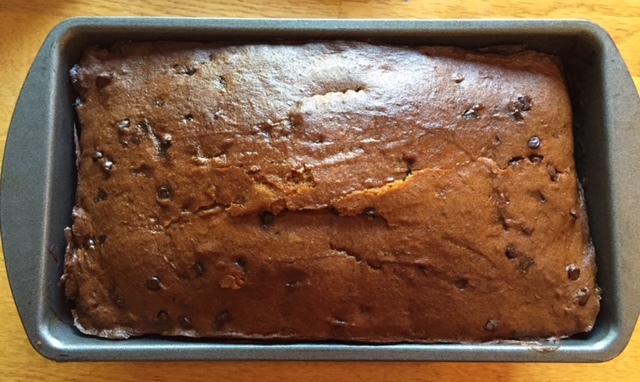 The sweet bread is actually moist and the pumpkin taste isn’t over powering. Great treat for the fall!! 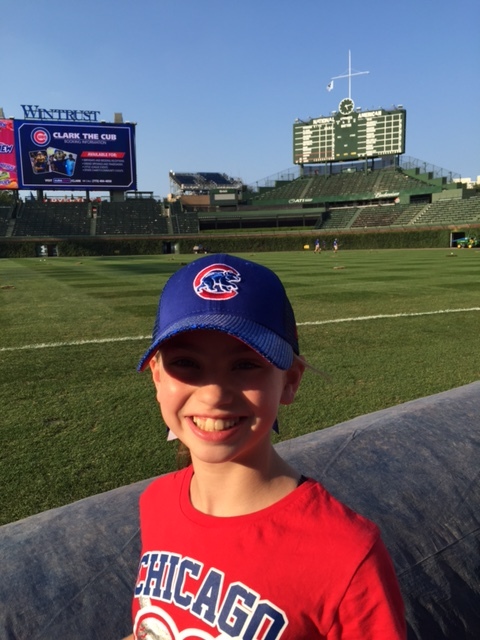 The Celiac Pack loves baseball and we are true devoted Chicago Cubs fans. We have been born and raised to love the Cubbies. 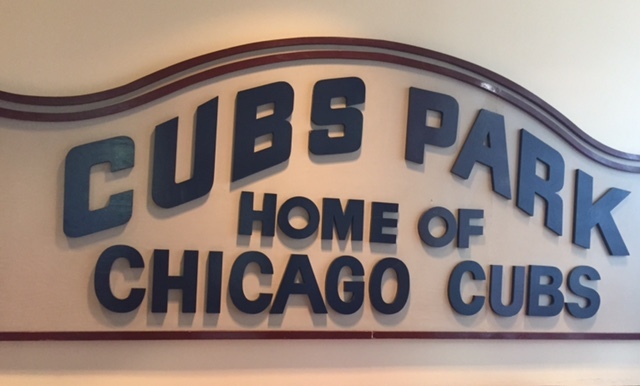 I have fond memories of watching the Cubs games on WGN with my grandpa and appreciate all the games he took my family to at Wrigley Field. 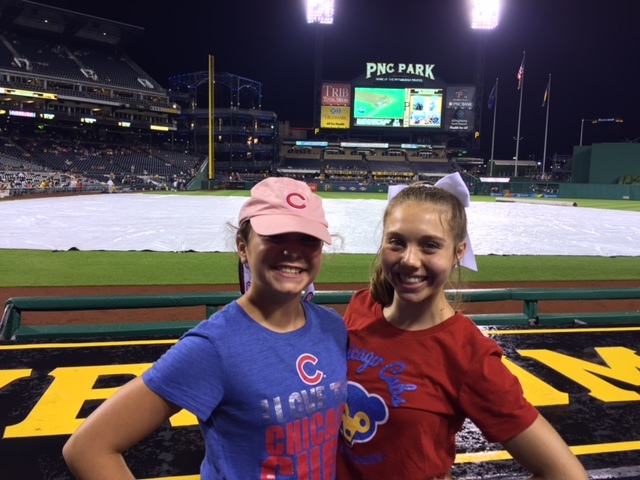 This summer we traveled to watch our dear Cubbies at three parks, the Milwaukee Brewers’ Miller Park, the Pittsburgh Pirates’ PNC Park, and of course, Wrigley Field, the home of the Chicago Cubs. 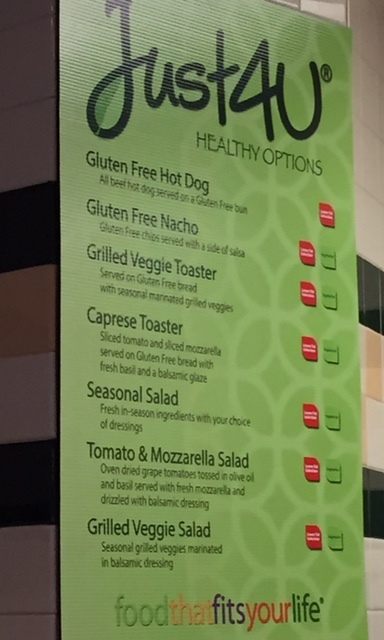 Although I do love Miller Park, there were such little gluten-free offerings (a hot dog- no bun…who eats that at a ball game), that I am not going to review their GF items. In the spirit of tomorrow’s National League Wild Card game, I will review the two parks of the wonderful contenders. 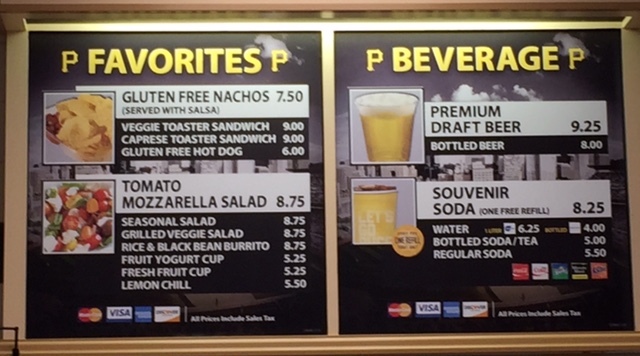 PNC Park has a concession stand where they sell gluten-free hot dogs and nachos. 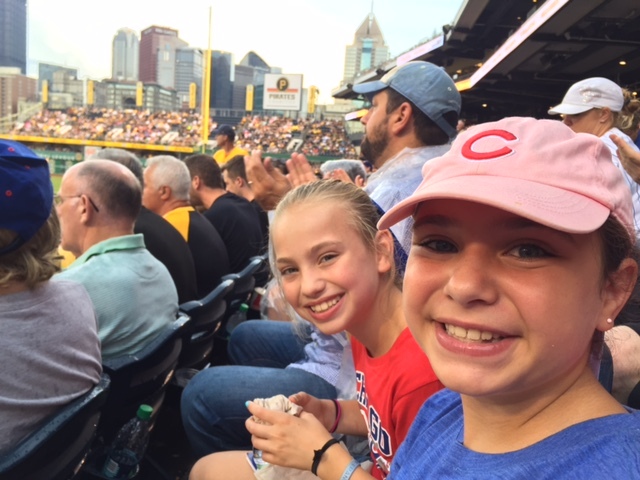 The girls were excited to have the opportunity to eat a hot dog at the ball park while watching the Pittsburgh Pirates host our Cubbies. 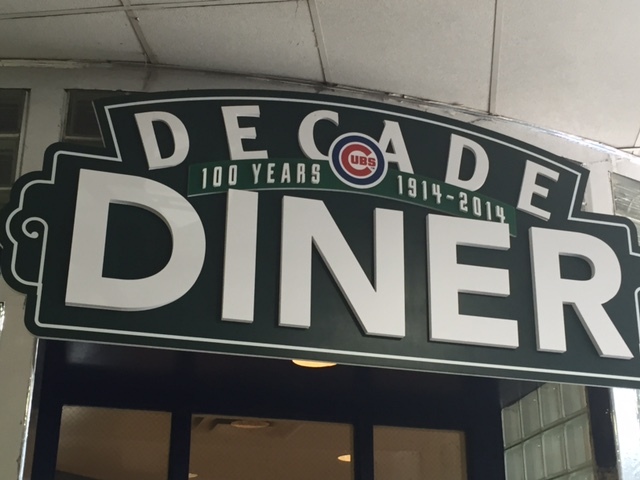 At Wrigley Field, you can enjoy a gluten-free hot dog or hamburger at the Decade Diner located by right field inside the park. There is no official menu posted, but this is the only place in the park they can accommodate with gluten free hot dogs, burgers, and buns. 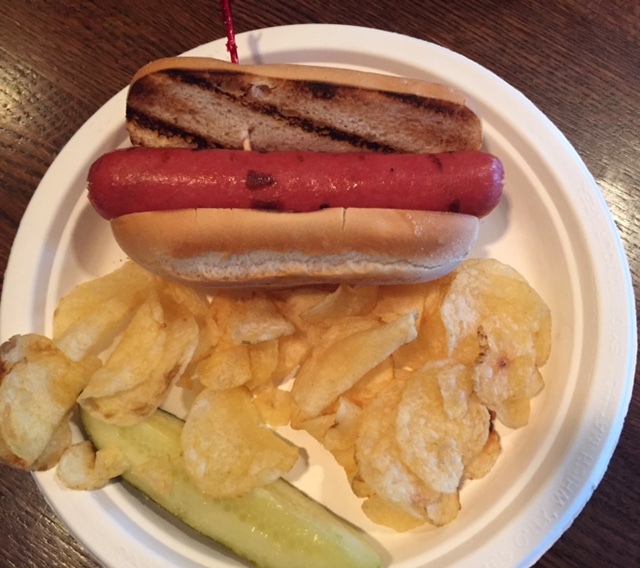 Judy and I both ordered a hot dog and it came with a side of chips and a pickle. 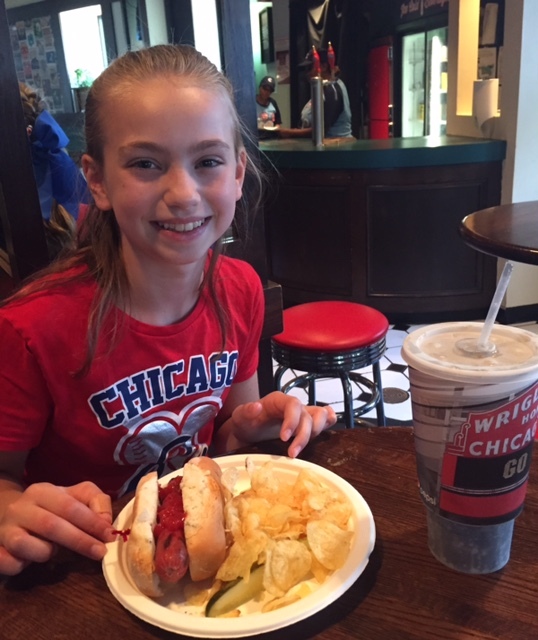 I was told there was a smaller concession stand closer to home plate with gluten-free snacks, but we never found it as Judy was content after her hot dog and chips. I think both parks have equal gluten-free offerings, they are just presented differently. I like that at PNC you can easily eat your hot dog in the stands; but the flip side is at Wrigley there is more of a restaurant/ diner feel. I enjoyed our time at PNC. The Pirates are an excellent team and they have devoted fans. We were welcome with open arms. I have to say I am hoping and praying this is OUR year. Of course I am rooting for the Cubbies all the way. Good luck to the Pirates! Cubbies, let’s Fly the W! Go Cubs Go! I love Funfetti cakes and cupcakes. I was really sad when I could not eat them anymore. My mom bought gluten-free Funfetti mix at the store. I was so happy. She made the cupcakes last Saturday and they tasted great! She added the vanilla frosting and sprinkles on top. 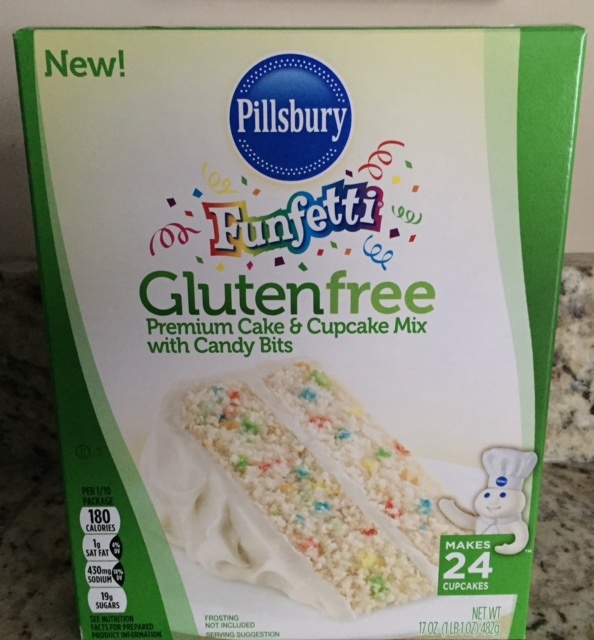 Thank you Pillsbury for making Funfetti gluten-free! 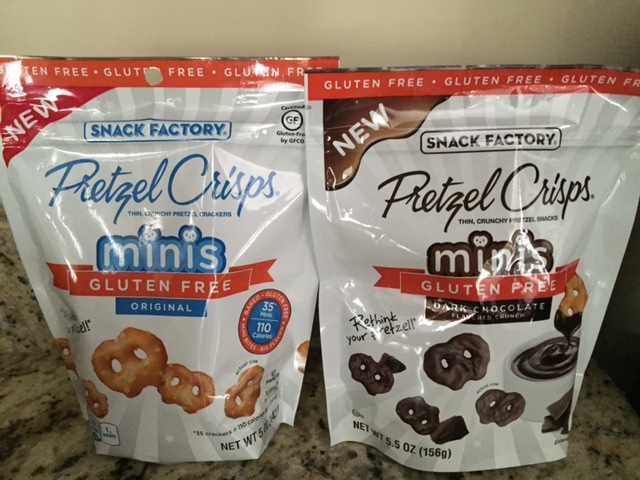 My mom found Snack Factory Gluten Free Minis Pretzel Crisps at the store. They are tiny and great for snacking. They come in a variety of flavors including original, dark chocolate, vanilla yogurt, and salted caramel. My favorite minis are the dark chocolate covered ones. They are delicious. My mom likes the original brand. She found mini bags of the original flavor at Target. It is nice to have on-the-go. I remember it like yesterday. My daughter was in kindergarten, my twin sons were only two years old, and my mom was in chemo treatment battling stage 4 breast cancer. Balancing my teaching job, with a sick mom and three small children was quite a challenging time. Just when I thought things were a little taxing, Judy started having stomach aches. She would cry and not want to get out of bed. Over time her stomach aches and pains would come and go and it was inconsistent. The doctor said to keep an eye on it and maybe she had a tummy bug or just some kindergarten anxiety. From Halloween to Thanksgiving she was on a down-ward spiral. Not only did she have constant stomach aches, she was sad, she had extreme mood swings, her legs ached and she did not want to do gymnastics or dance class anymore. She was skinny. I mean so thin her ribs stuck out. She was not short, but she did not have an ounce of fat on her body. She was not my “happy Judy” anymore. Her sparkly personality wasn’t always there anymore. Her teacher would call me and say how her personality is changing. She had a terrible rash on her head and back and she would scratch and scratch; I was told she had eczema. She started having extreme thirst so I brought her back to the doctor in December. I went to “Dr. Google” and researched these symptoms. I was convinced she had diabetes but also learned that the symptoms for Celiac disease were similar being an autoimmune disorder. Judy has a cousin with both diseases so I wanted her tested for both. I knew in my heart there was something seriously wrong with my daughter, something causing the anxiety, depression, mood issues, leg pains, stomach aches, weight loss, and rashes. The blood results came in and she was diagnosed with Celiac disease. My heart sank. My baby has an autoimmune disorder? There is no cure? It can trigger other autoimmune disorders? 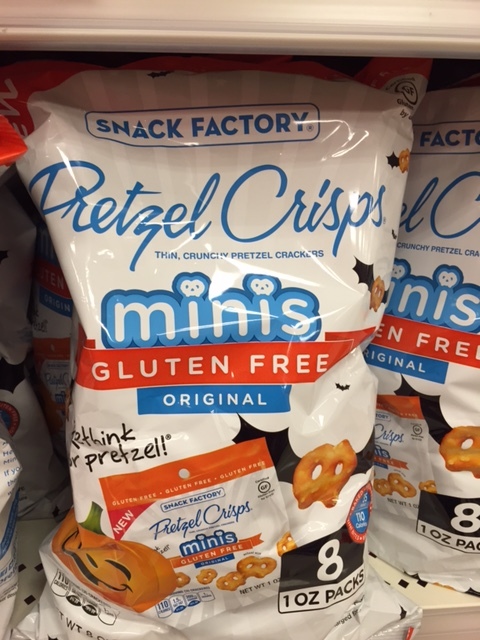 WHAT…GLUTEN-FREE FOREVER?? ARE YOU KIDDING ME?? She was referred to a pediatric gastroenterologist right away and he scheduled an endoscopy within a week. I couldn’t believe my child had to have this procedure, my little peanut, but the endoscopy would confirm the Celiac diagnosis. When we went over the results with her amazing gastroenterologist he promised me that ALL of those symptoms would go away with a gluten free diet. Even her rash was not eczema; it was Dermatitis Herpetiformis, a skin condition caused by Celiac disease. He looked at me and said Celiac disease is not allowing your daughter to receive any nutrition, not only keeping her super-skinny but there is no way to regulate emotions without nutrition. He promised me with a gluten free diet my little girl would come back to us. Don’t get me wrong, it is never smooth-sailing when you have Celiac disease. Judy will always have blood work, she will always be monitored by a gastroenterologist, she tends to get sicker quicker and it takes longer to get better than her peers because her immune system is compromised, and she will never be able to walk into any restaurant or bakery and order anything she wants. She will always have to monitor her diet. She will always have to be aware of cross-contamination. It will always be a daily challenge. 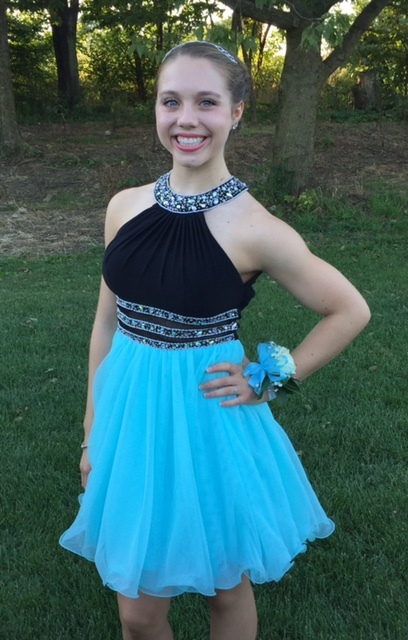 Celiac disease does not define my daughter. She is a ten-year-old child that loves gymnastics and golf. She loves to be with her family and friends. She loves fashion. She glitters inside and out. I am truly blessed to call Judy my daughter. Today, on National Celiac Awareness Day, I am grateful to modern technology, wonderful doctors and nurses, and researchers who devote their time and energy to find a cure for this terrible disease. I pray every day they will be able to find a cure. Thank you to the companies for the gluten-free products that keep coming onto the market and to our stores. I am eternally grateful. Celebrate Valentine’s Day with a Cookie Cake!